Nelson Ireson May 15, 2013 Comment Now! While the fight for dominance at the top of the full-sized luxury sedan class is an elegant affair, governed by gentleman's rules, it's still a fight--and a fierce one. 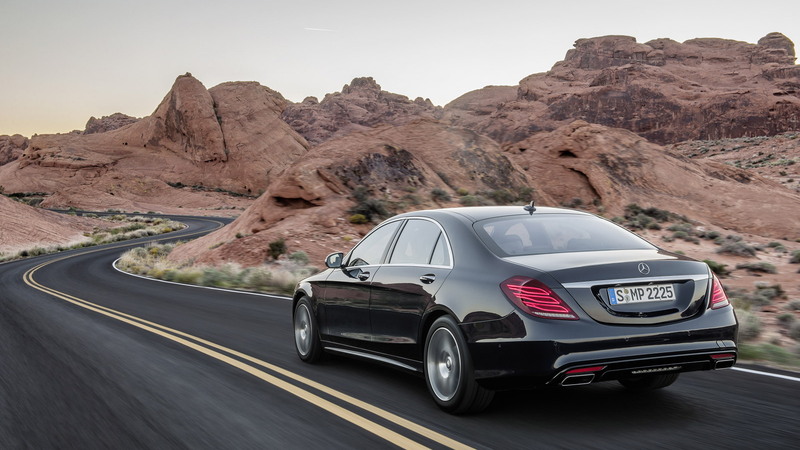 Today, the 2014 Mercedes-Benz S Class enters the ring looking for a knockout. What is the S Class' secret combo? Three engineering priorities: "Intelligent Drive," "Efficient Technology," and "Essence of Luxury," according to Mercedes-Benz. 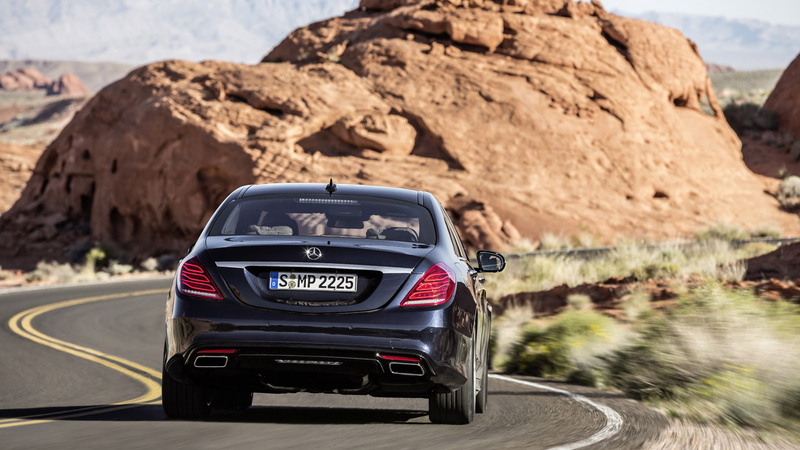 With these, the S Class seeks to raise the bar for the entire automotive world. "Rather than being about safety or aesthetics, power or efficiency, comfort or dynamism, our aspirations were 'the best or nothing' in every respect. No other car stands for the Mercedes-Benz brand promise more than the S-Class," said Daimler chairman and Mercedes-Benz chief Dr Dieter Zetsche. 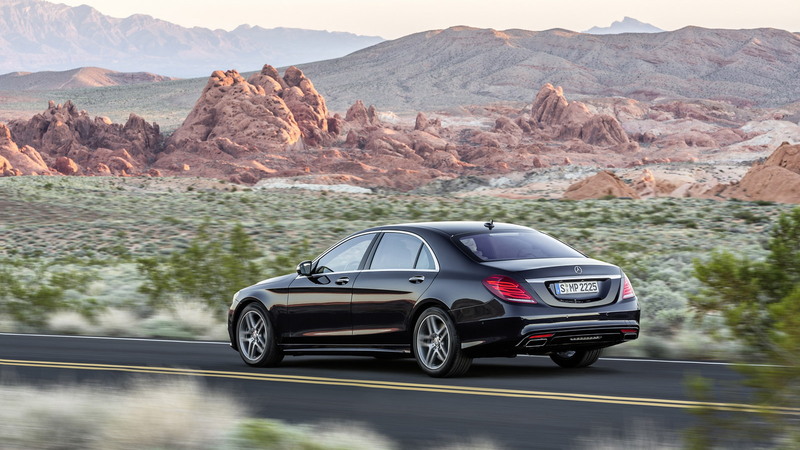 Coming this September, the first of the 2014 Mercedes-Benz S Class models to reach the U.S. will be the S550. Powered by a 455-horsepower, 516-pound-foot twin-turbo 4.6-liter V-8 engine, the S550 will hit 60 mph in an estimated 4.6 seconds and a top speed of 130 mph. Following in November, the S550 4MATIC will add all-wheel drive, otherwise matching the rear-drive S550's power and acceleration stats. The S63 AMG will also join the lineup in November, but Mercedes-Benz hasn't yet released any specifics on the model. A plug-in hybrid will come around Q3 2014. 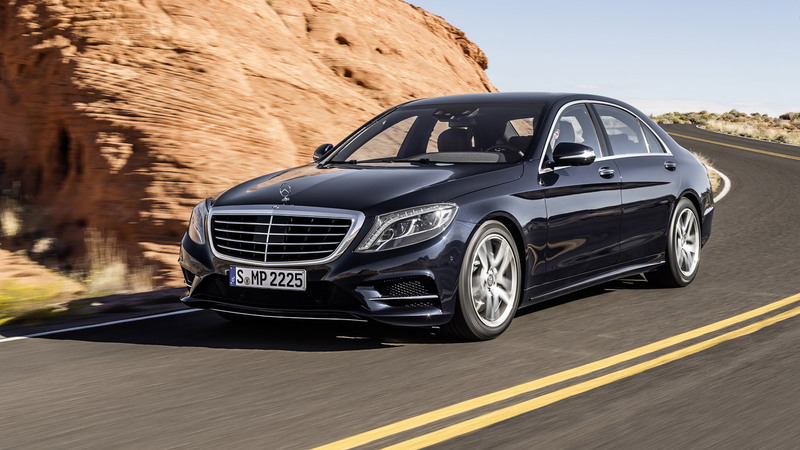 Unlike previous S Class sedans, the 2014 model has been designed around the long-wheelbase version first, with the shorter model adapted from it, rather than vice-versa. That works out well for the U.S., as we'll only get the long-wheelbase models. A wider track (about an inch at each end) increases cabin space, and while the wheelbase remains the same as the last S Class, headroom is up by 12 mm, shoulder room increases 14 mm, and elbow room is up 10 mm. In the rear, shoulder room increases 9 mm, and knee room is up by 14 mm. Updated styling marks the new S Class apart from its predecessor, with the nose leading the way. The grille opening is enlarged and more upright, offset by a louvres lower intake. A chrome strip along the lower part of the bumper accents the lines, which are themselves redefined by new headlight contours. The front end has also incorporated pedestrian safety elements into its structure, raising and lengthening the front end. From the side, the proportions are familiar, with a character line sweeping from front to rear, intended to create a convex-to-concave effect to give the long, large sedan a leaner look. At the rear, horizontal lines widen the stance, while the rear window is shaped to imitate a coupe's curves. All-new tail lights with three horizontal fiber optic elements are encased by the rear bodywork, which slants slightly to enhance aerodynamics. Inside, the 2014 S Class builds a theme of "visual breadth and calm solidity." While that's a uniquely German way of describing an opulent, richly detailed and finished cabin, it's perhaps not inaccurate. While thoroughly modern, with a unique LCD instrument cluster that integrates the driver's pod with the large, wide high-resolution center display screen, the overall effect isn't the frenetic ADHD-addled feel you'll find in some high-tech luxury interiors. Instead, warm woods and lush leathers combine with classic and new Mercedes-Benz design elements to form an enveloping, rich cabin that echoes a luxury business jet. A new two-spoke wood and leather steering wheel holds the audio and driver information controls, while the rim helps visually divide the large instrument and center displays. Lighting filters out from under the wood trim strips and the central display unit, highlighting the dashboard's lines. In the rear, the same materials and design carry over from the front row, with available reclining seats which incline into the parcel shelf, rather than compromising leg room. Further solidifying the luxury jet feel, a First Class Rear option adds a "business center" console that includes a telephone handset, folding table, and additional compartments. While the full equipment list of the 2014 S Class would fill a small book, highlights of new standard features include an updated mbrace2 infotainment system, Burmester audio, twin 12.3" high-resolution displays for the instrument and head unit, Collision Prevention Assist, Magic Vision Conrol, and LED ambient lighting with a choice of seven colors. New optional extras include Magic Body Control, which uses a stereo camera to scan the road surface, adjusting the suspension dynamically to make for a smoother ride. An "energizing" massage function based on hot-stone principles is also available. A Warmth & Comfort package adds heated steering wheel, heated front/rear armrests, heated and ventilated rear seats, and power/memory rear seats. There's also a full slate of driver assistance and safety features, including the optional Driver Assistance Package, which brings Active Lane Keeping Assist, Distronic Plus with Steering Assist, Cross-Traffic Asist, and Pre-Safe brake assist with pedestrian recognition. Other standard or optional safety features includes a Surround View Camera, Active Parking Assist, Night View Assist Plus, and rear seatbelt airbags with active pre-tensioning belt buckles. Final U.S.-market pricing and gas mileage estimates have yet to be determined. 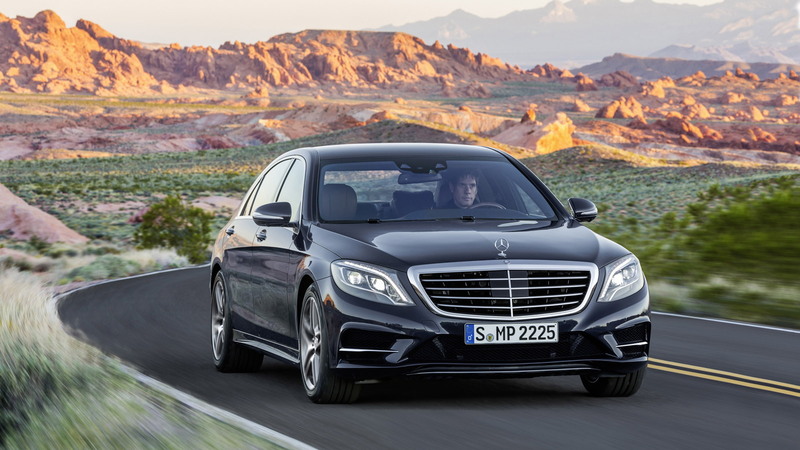 We expect further details to come as the 2014 Mercedes-Benz S Class nears its American arrival this fall.